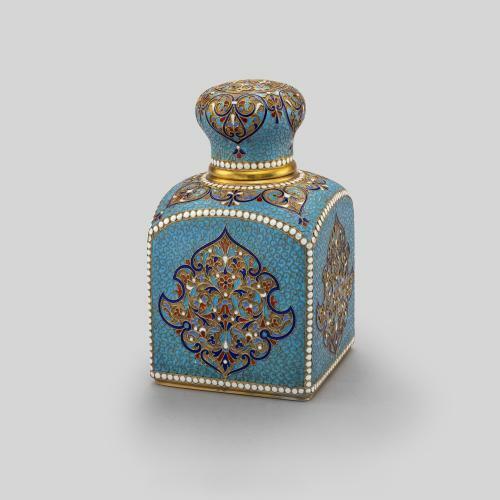 This tea caddy was made by the celebrated Russian workmaster Feodor Rückert, who specialised in the production of cloisonné enamels for the firm of Fabergé. A celebrated enameller, Rückert sold works through other large firms such as Ovchinnikov as well as through his own account, and was renowned for his use of bold and personal designs and colour schemes. From around 1908, Rückert began to use muted colours such as yellow, blue, olive green and lavender, which can be seen on this tea caddy. This became characteristic of his work up until his death in 1917.